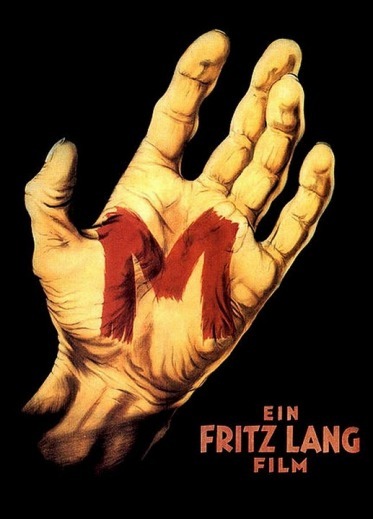 Made in 1931, Fritz Lang’s M is a film which has, unlike many of the same period, aged rather well. Coming just years after the advent of ‘talkies’, its dialogue is remarkably well written and performed. Similarly, the themes explored in the movie are just as relevant today as they were upon M’s original release. Set in Berlin, the story tells of Peter Lorre’s unnamed child-killer. Despite having killed at least eight young children, the police have no concrete leads and are stretched to capacity. With swarms of officers combing the city for the murderer, organised crime syndicates and brothels are forced to quell their activities, severely disrupting their capacity to earn money. As a result, one crime-clan decides to take the law into their own hands and catch the killer themselves. Lang sets the scene with predictable Teutonic efficiency. As children sing nursery rhymes about the murderer, his next victim innocently bounces a ball against a poster detailing the killer’s crimes. Just seconds later, he abducts her. Even more impressive is the way the director creates his panicked city. Through a combination of short scenes and voiceovers he depicts various raids, avenues of investigation and encounters with the prickly and frightened public. Everyone is implicated and yet nobody is prosecuted: the investigation is a shambles. Thankfully, the criminals are more resourceful than the police, recruiting the local beggars as spies. This information network quickly reveals the identity of the killer – thanks largely to a creepily whistled musical motif. It’s at this point that M gets really interesting. Whilst its theme of moral panic still resonates with a modern audience, it’s the idea of vigilante justice which remains most relevant. The murderer (probably the first psychopathic serial killer scene on film) is brought in front of a kangaroo court to plead for his life. It’s a stunning set-piece. Peter Lorre’s acting looks a little dated now, but still packs a weighty emotional punch – as well as posing some serious moral questions. Lang’s direction and cinematography here are glorious: the assembled crowd are shot as a grotesque gallery leering at their prey, yet he still manages to create a sense of ambiguity about which way their decision will go. It’s a shame that the rest of M doesn’t quite match its amazing ending. At time the pacing is a little pedestrian. Over the years there have been various restorations made to the original print which have added to the running time – perhaps Lang’s more compact cut was a snappier production. There are some scenes which could certainly have been lost with no effect on the narrative. Many of these have no sound whatsoever – this could be a hangover from the recent ‘silent’ period, but more likely the sound simply didn’t exist when restoring the print. It’s slightly churlish to complain about such things, however. If Lang had concentrated solely on advancing the storyline, he wouldn’t have given us some of the beautiful cinematography he produced here. Poetic cutaways of a child’s ball and a balloon trapped in power lines have become iconic, but it’s the expertly framed shots of geometric shapes (buildings, windows and staircases particularly) which stay lodged in the mind. Various filmmakers owe a debt of gratitude to Fritz Lang and his influence has been enormous. For students of cinema, M shows exactly why. Although aspects of his masterpiece have dated, it’s still a movie with interesting things to say about cinema and, more importantly, society.